Among all the minerals — and there are literally hundreds of them — gold long has played a unique role. Man’s fascination with gold goes back to the beginnings of recorded history. Although gold is one of the rarest of the elements, it is also one of the most widely distributed. It is ubiquitous in nature, found in every continent and on most of the world’s islands. Gold is an enduring material, resisting corrosion in even the most hostile environment. In consequence, scientists estimate that of all the gold ever wrung from the earth and converted into metal, at least 90 percent still can be accounted for in bullion bars, coins, jewelry and objects of art carefully stored today. Gold is remarkably malleable. One ounce of gold can be spun out into fine wire stretching many miles. Gold’s marvelous reflecting power has allowed it to be used in spacecraft as a shield from the enormous heat of solar rays outside the earth’s atmosphere. Its thermal and electrical conductivity exceeds those of base metals. Were gold less expensive, these attributes would ensure its use in many industrial applications. But because of its rarity and its value in monetary, ornamental and artistic applications, the price of gold discourages its use except in applications where its properties are indispensable. Of all the gold marketed in recent years, about 8 percent has been consumed in electronics (largely for contact points) 4 percent has been used in dentistry and another 4 percent has been consumed in strictly industrial applications. Far more gold is fabricated into jewelry each year than into these other more mundane areas. Because only one-sixth of the gold supply is taken by industry, the market is governed primarily by the metal’s perceived function as a store of value (including jewelry). Gold’s strong price-performance has stimulated a boom in exploration for gold bearing deposits. Because prospectors have been combing the world’s mountains, plains and rivers for gold over many centuries, some might suppose that most gold deposits long since have been found. But instead, the exploration-boom is resulting in major discoveries of new deposits in every continent and many offshore islands. In addition, resources in mines that have been producing for decades have been extended substantially. A striking example is the gold founded in the Rio Motagua, in the Motagua fault, and other areas in Guatemala. Similar expansion is under way in Australia, Brazil, Canada, Chile, Papua New Guinea and many other countries. South Africa, which long accounted for more than half the world’s gold production, continues to produce massive amounts of the metal, but it no longer dominates the industry as it once did. Some have suggested the rising tide of new gold production in time will swamp the market, forcing prices downward. Certainly this would be the case in other commodities if supplies rose sharply. But gold is different. In the gold market, the new mine production each year is only one part of a complex supply pattern. Most of the gold that ever has been mined still is available as bars, coins or readily recyclable jewelry. At a high-enough price, this gold — whether held by individuals, corporations or central banks — is potentially part of the market supply. This was clearly the case in 1979 and 1980 when prices rose sharply. And it has been true subsequently, as central banks of debt-ridden governments have been liquidating at least a portion of their gold reserves. 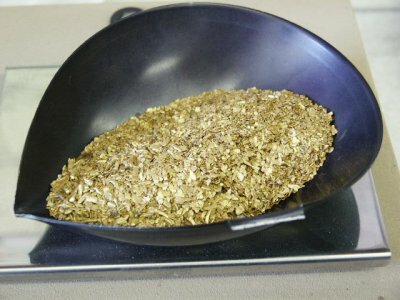 Currently, gold production is less than 2 percent of the potential gold available from previous production — a unique situation that does not apply in most other commodities. Given political or military uncertainties, or high rates of inflation arising from economic mismanagement, the demand for gold could accelerate, absorbing not only the current new mine production, but also reaching out for part of the accumulated stocks from yester-year. To coax this gold back into the market might require sharply rising prices — as it did in 1979 and early 1980. Now that the price of gold is no longer tied at a fixed rate to any currency, the one certainty is that the price will fluctuate, and at times, perhaps very erratically. Yet gold’s beauty and its strong roots in mankind’s traditions combine to assure us that it will continue to play a significant role in human societies. Other metals are subject to very different influences than is gold. For the most part they are highly sensitive to the swings in the business cycle. Indeed they tend to exaggerate those swings, rising more rapidly in periods of expansion and falling more precipitately in periods of contraction. Industrial society’s dependence on these non-renewable resources — the metals — has given rise to recurrent concern about imminent exhaustion of known supplies. The consequence has been that numerous studies have been undertaken in an effort to ascertain how long supplies are likely to be available. In the interest of generations yet unborn, strong measures are advocated to conserve resources and to maximize recycling. But most appraisals are based on what we now know. The high rate of discovery of recent years is not going to end suddenly. New prospecting techniques — electro-magnetic surveys, soil sampling and other procedures — are multiplying the possibility of detecting deposits that do not outcrop on the surface. Enormous resources exist under the ocean deep — perhaps not viable in today’ s markets; but they will constitute significant potentials for future supplies. The bleak prospects are not going to develop in the foreseeable future. Gold is very different from other metals. The demand for gold largely revolves around its role as a store of value. Public perceptions affect that demand very strongly. One might say that gold is mankind’s security blanket, affording a feeling of abiding value, a sure haven in a period of economic storm. For other metals, the needs are physical, where for gold they are largely psychological.